I can't believe it's been one year since we finished the renovation of the master bathroom. I still love it. I love how much brighter it is and how it looks larger than before. There is just one thing we would change and it is really quite minor. Last year I had a vintage rack hanging on the wall to hang towels on, but I moved it and hung up artwork instead. I would choose the same colors again. 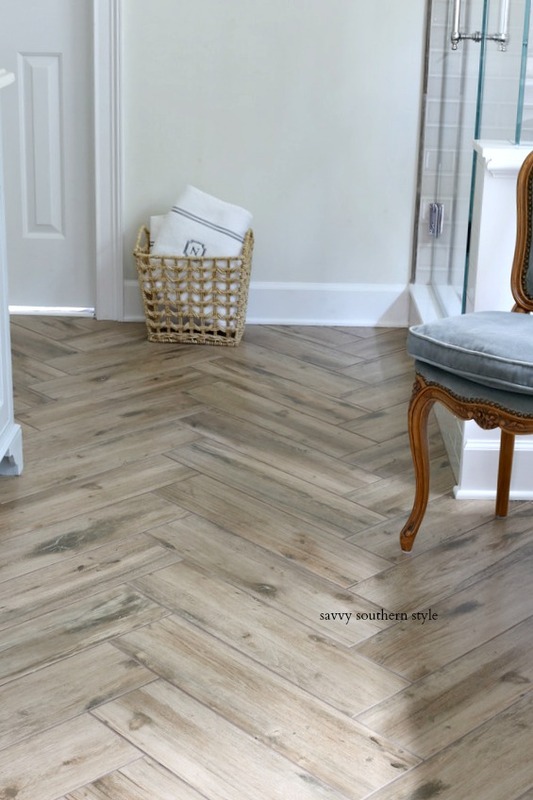 I'm still in love with the wood tile laid in a herringbone pattern. Love the tub, but I'm really a shower girl and have only used the tub around five times. Very glad we had this built in added for storage. So glad we added the chandelier in the center of the bathroom as it adds much needed light. I don't care for dusting it though. The one thing I would change and this may get changed out eventually is the sink faucets. The faucet doesn't extend out far enough in the bowl and water runs onto the counter around the faucet and handles. If it had been moved closer and in line with the handles it would be okay. It's an easy change we can make later. The reno was tough to live through, but I'm so glad we did it. See the full reveal post here and the details and sources post here. I still love your bathroom. Even though our new master bath is completely different, I kept referring to yours for inspiration. Clean your shower door with shampoo that doesn't have any conditioner in it. It takes the crud right off. We even wrote a blog post about that once. Oh, thanks, Janette I'll try that! Your bath is really beautiful. There is always that ONE thing we would change! When we had a glass shower we would use a squeegee after every shower. I still love your bath too. Kim- I hold the same complaint! The granite fabricators INSISTED we had to maintain so many inches from sink hole to faucet hole and even the longer extending faucet couldn't bridge the distance enough. So I was making double-sure to address this situation on my current bath reno. I told the plumber my issue with this--and he pushed the faucet back on me as soon as I left the room! So once again, the faucet "barely" reaches into the sink--Arrrrgh. But your faucet selection is really beautiful--as well as the whole bathroom! Going through this now, it is a pain but I am sure it will be worth it. Love your bath it looks fabulous. Your bathroom is gorgeous. I am envious of all that space...a chair and a built in? Swoon. In 1920 bathrooms were a necessity and not a luxury, we're lucky that there's even one in the master of our little beach cottage, but it's tiny. 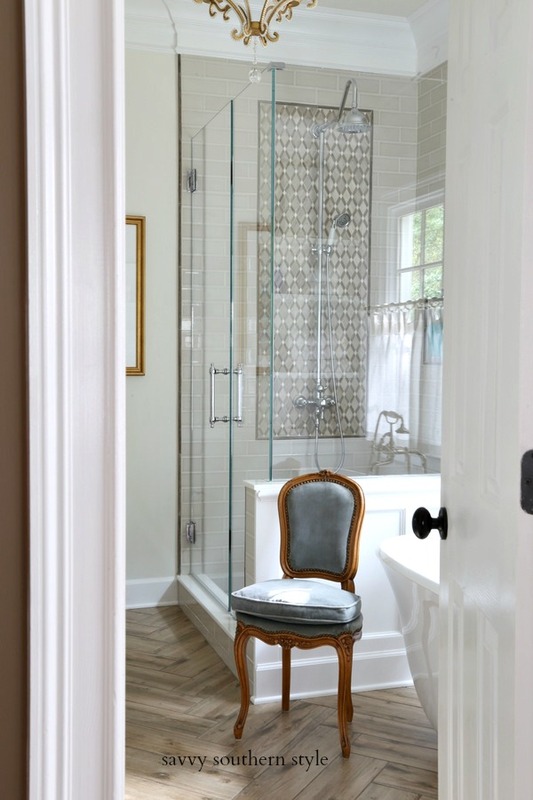 A standing shower, a toilet and a super small vanity are squeezed in tight, but they work! And I totally get it with the faucet. We have the same issue. Makes me crazy! Pretty room Enjoy it! Love your bathroom! I had the same floor installed in my master bath and love it! We are still debating glass shower doors or a custom shower curtain...our well water eventually leaves hard water stains. If that tub were mine, I'd be in it right this moment! Mrs. Meyer's has a shower cleaner that I really like. Hubby puts car wax on our glass in the shower. I clean them once a month and he re applies it. Or you can use rainx. Yes, getting some good tips on the glass, but it's the whole shower that is tough to clean. It's three times the size of what we had before, but I still love it. I renovated my bathrooms a couple years ago & chose the English/European bridge faucets with exposed plumbing as well. My sink faucets match that style - they are on a bridge with an arched faucet that swivels from side to side. They are well over the sinks but if you have to - say, put your whole face in the sink, you just swivel the faucet to the side. I love their style & their functionality!! In one bath, I chose oil rubbed bronze plumbing & in my bathroom, I chose the same but it is bright brass. Love that look! My husband always sprays our shower glass with RainX --- it's what he uses for our car windshield so that rain pretty much just falls off. Try it on the shower, too. I have a similar situation with my window in the shower. What type of fabric did you use for your curtains? Just curious! When we remodeled I decided to forego the tub and opted for more closet space. I haven't missed it one bit as I'm a shower girl, too. Love everything in your bath! You did a great job with the reno of the bathroom and if there is only one thing you would change I think that is pretty good in the scheme of a renovation...the faucets are an easy fix and Mr. Savvy can certainly remedy that!...I would have to call a plumber! Your bathroom is absolutely gorgeous and the faucets are an easy change if really needed. This summer, I rented a holiday cottage for a week and I noticed that bathrooom faucets are always too short in French holiday cottages! Maybe that was your inspiration?? ?